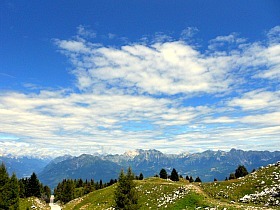 Monte Faverghera, a Hidden Botanical Jewel with Stunning Views Over the Dolomites. Monte Faverghera is an open mountain slope culminating at 1,611 m which conceals a real botanical jewel, as it hosts the Giardino Botanico delle Alpi Orientali ("Botanic Garden of the Oriental Alps"). This is an outstanding Alpine botanic garden, and one of the foremost scientific institutions of its kind not just within the province of Belluno, but – despite its name being little known – in the whole Alpine range. The garden was created in 1969 on a piece of land that still belongs, to this day, to the Corpo Forestale dello Stato (the Italian Forestry Commission); it is located in the grounds of a dismantled quarry near the top of a mountain ridge that overlooks the provincial capital of Belluno. Officially known as Giardino Botanico di Monte Faverghera – but shortened as Monte Faverghera – the garden was inaugurated in 1972, but the original layout was significantly altered in the 1980s to comply with the new European directives regarding the management of Alpine botanic gardens. With an area of 6,25 hectares, you may be forgiven for thinking that it is not very big, and yet Monte Faverghera contains an astounding number of plants, while the varied topography makes it look – and feel – bigger than it actually is. This is perhaps also because its perimeter is contained within a Nature Reserve which is about 606 hectares big, and therefore the garden is completely surrounded by a natural setting – as can be appreciated in the image above. Monte Faverghera is at an altitude comprised between 1,400 and 1,600 meters, and it contains about 800 plant species, about half of which are cultivated, while the other half are spontaneous; some of these are rarities, and therefore not so easy to spot in nature (such as Delphinium dubium, portrayed above, which can be seen in the area of the Vette Feltrine). The garden is structured in such a way as to provide a phyto-geographical key based on the ecology of the species and their distribution. Alpine plants are grown and laid out with the intent to give each individual species an environment similar as much as possible to the one in which they would grow naturally. Monte Faverghera also contains a number of habitats that are representative of high mountain environments, ranging from meadows, pastures, dry valleys, humid valleys to sub-alpine scrub, woodlands and wetlands (swamps and bogs). The high alpine habitats (such as limestone cliffs and Dolomite scree) are probably the highlight of the collection, which is particularly dedicated – as the name of the garden suggests – to the flora of the Oriental Alps. As well as for the plants, the views that can be enjoyed on the Dolomiti Bellunesi and the Vette Feltrine – overlooking the other side of the val Belluna – make the visit all the more worthwhile. Within the garden there are three themed trails, and even though the views can be enjoyed from everywhere, they are particularly stunning from the ‘panoramic trail’, which unwinds through flower-strewn Sub-alpine meadows to an elevated viewpoint. In fact, being up there feels very much like being on a terrace suspended in mid-air, with amazing views that sweep undisturbed at almost 360 degrees (only looking south the view is hindered by the top of the mountain ridge that separates the val Belluna from the Venetian plains – but a complete view can easily be enjoyed with a 30 minutes’ walk from the garden; more on this below). The karstic nature of the terrain is also evident, as there are a lot of ‘doline’ ('sink holes'), Karrenfelds ('ridged fields') and other features that are typical of environments where water percolates to create complex underground systems. 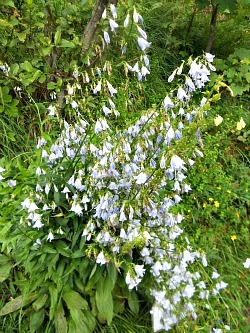 These phenomena can be particularly appreciated when walking along the didactic route of the ‘karstic trail’ (below, see an image of Adenophora triphylla – Scented Bellflower – one of the outstanding presences that can be admired along this trail). 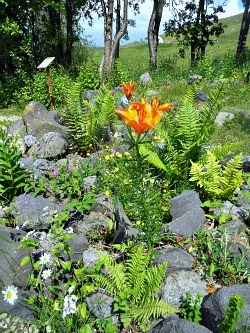 The proper ‘botanical trail’ is divided into three sections. In the first section are represented a group of species characteristic of primary and secondary meadows on limestone subsoil, from the Alps' foothills to Sub-alpine altitudes. 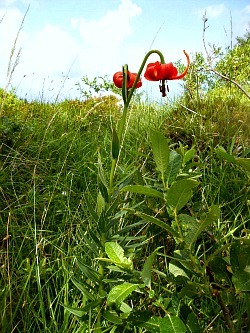 Among the most interesting species to be found here are Carniola Lily (Lilium carniolicum; second picture above), Moltkia suffruticosa, the yellow-flowered Alpine Knapweed (Centaurea alpina; see first picture below), the unusually pink-flowered Scorzonera rosea (second picture below), the Monkshood Aconitum anthora and Iris cengialtii – endemic to Monte Cengio (1,354 m), a mountain in western Veneto. The second section is located in the middle of the garden, and groups together habitats which are common to the eastern Alpine board; amongst them, lean acidophile pastures with mat grass (an association botanically known as 'Nardetum', from the leading species Nardus stricta); low basophilic peat bogs with Swertia perennis, Bird’s Eye Primrose (Primula farinosa) and Tofieldia calyculata; acidophile peat bogs with clumps of Sphagnum moss, in which the carnivore plant Drosera rotundifolia can be found alongside Vaccinium oxycoccos, Andromeda polifolia and the grass Carex pauciflora. 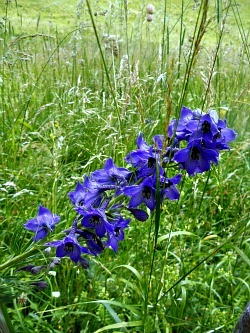 Wet meadows have as their dominating species another grass, Molinia caerulea, together with the rarer Marsh Gentian, Gentiana pneumonanthe. In this section there are also small ponds, over which float the leaves of some hydrophytes that root at the bottom, but develop a photosynthetic apparatus on the water surface. Grasses (mostly from the Graminaceae family) that dominate the meadows and rich pastures are accompanied by the pretty spring blossoming of Globeflower (Trollius europaeus), Paradisea liliastrum and Narcissus radiiflorus. The habitats on the rocks and on landslide detritus ('scree') are perhaps the core of the garden, which is the rock garden – and certainly this area is the richest in endemic and rare species. A first part comprises subsoil of a siliceous, acidic nature that recreates habitats typical of the magmatic and metamorphic areas of the eastern Alps: snow valleys with Dwarf Willows such as Salix herbacea, Dwarf Cudweed (Gnaphalium supinum), the creeping Sibbaldia procumbens and the beautiful blossoms of Snowdon Lily, Lloydia serotina. Typical of sub-alpine heathland are the dwarf bushes of Creeping Azalea (Loiseleuria procumbens) and of Empetrum hermaphroditum, found together with fruticose lichens. The primary meadows are dominated by grasses such as Festuca varia and F. halleri. Landslide detritus, broken rocks and moraines are colonized prevalently by pioneer species such as Geum reptans (Creeping Avens), several Saxifrages (such as Saxifraga cernua), Oxyria dygina and Alpine Willowherb (Epilobium fleischeri), while compact rock faces are characterized by such species as Glacier Mouse-ear Chickweed (Cerastium uniflorum), Red-Alpine Primrose (Primula hirsuta) and the Spider-net Houseleek, Sempervivum arachnoideum (see image below). In the second part of the trail, a scree has been recreated to host species of Alpine flora typical of the Dolomites' calcareous ground (limestone massifs): snow valleys habitats with Netted Willow (Salix reticulata) and the Cudweed Gnaphalium hoppeanum; discontinuous Alpine meadows featuring clumps of the grass Carex firma, to which are associated some other tiny but fascinating plants. 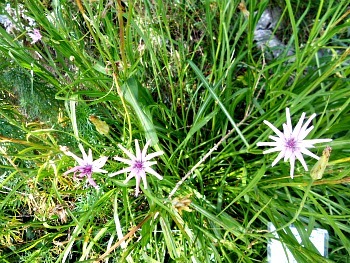 Here grows for instance a spectacular Pink-flowered Campion, Silene elisabehtae, endemic to eastern Lombardy – extremely localized and for this reason included in the Red List. On landslide detritus with loose material find their ideal home the Pennycress Thlaspi cepaefolium, Linaria alpina (Alpine Toadflax) and Alyssum ovirense – the latter one a rarity that the can be spotted in nature on the Vette Feltrine. The more sheltered area of Monte Faverghera hosts the Rock Jasmine Androsace haussmannii – another species typical of the Dolomites – and Rhyzobotria alpina, an endemism of the South-eastern Alps, included in the national and provincial Red Lists. Limestone rock faces colonized by plants that grow in cracks and crevices – some of which are also endemic to the Dolomites – include the rare Tyrolean Primrose, Primula tyrolensis, spontaneous in the area (and chosen, for that reason, as the garden’s symbol). 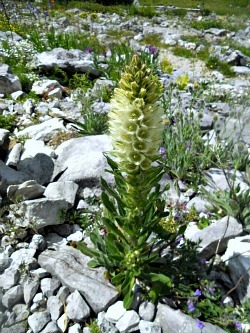 It is impossible to list all the notable plants hosted at Monte Faverghera, but some of the other rarities include Alpine Devil’s Claw (Physoplexis comosa), the Yellow-flowered Veronica Paederota lutea and P. bonarota, Moheringia glaucovirens, Arenaria huteri, Wulfenia carinthiaca, the unique Yellow-flowered Bellflower (Campanula thyrsoides; see first image below) and Dwarf Alpenrose, Rhodothamnus chamaecistus, while the symbol of neighboring Dolomiti Bellunesi National Park – the elusive Campanula morettiana – can also be admired here, growing on damp rock crevices. 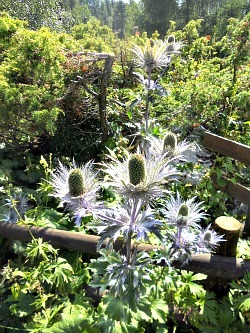 One of the most outstanding presences in the gardens are the magnificent silver-lilac, spiky flower heads of Eyngyum alpinum – quite rightly known as the "Queen of the Alps " (second picture below). To enjoy the beauty of the blossoms, the best time to come to Monte Faverghera is certainly from late June up to all the month of July, but an August or even an early September visit will still reap its rewards – bearing in mind that the opening of the garden is seasonal, from mid-June to mid-September only, with a small entry fee. Notice also that you can only reach Monte Faverghera by foot – for which you have two options. 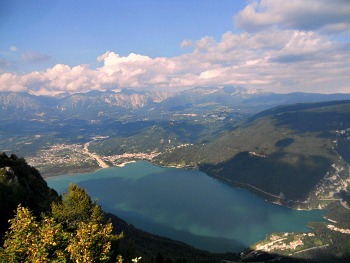 You can either drive to the car park situated near Ristorante Bar “La Casera” and then from there walk about 20 minutes uphill – with more and more impressive views on the Lago di Santa Croce down below and the mountains of Alpago as a backdrop (as pictured below) – or you can take the chairlift to Rifugio Brigata Cadore (1,617 m), from which you then walk about ten minutes, this time descending. In any case, in my opinion this relative isolation is a definite ‘plus’, as it makes the area completely car and noise-free – apart from the rustling of wind through the spruces and larches: but that can hardly be called a 'noise', can't it? 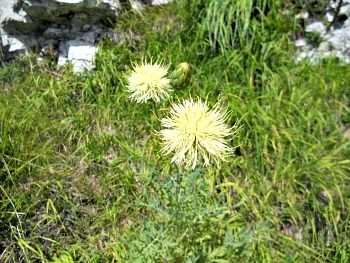 The area outside and around Monte Faverghera is also quite interesting. The medium-height ridge of mountains that separates the val Belluna from the Venetian plains down below can be reached in about 30 minutes' walk from the garden; these are the rounded summits of Col Visentin (1,763 m), Col Toront (1,675 m) and Col Faverghera (1,611 m). These peaks are connected by a panoramic trail called the ‘ridge pathway’ (“Sentiero delle Creste”), which – once reached the first summit – becomes quite flat and easy, and therefore suitable for all abilities; near each summit there is a ‘Rifugio’ (mountain hut), and these are also linked by the ridge pathway in sequence (besides the Rifugio Brigata Cadore, mentioned above, there are Rifugio Angelo Bristot, 1,616 m and Rifugio V Artiglieria Alpina, 1,763 m; in the closing picture below is another image of the Rock Garden, with Lilium bulbiferum).